The Yoder family argued that use of electricity violates its religious convictions. The family has used an outhouse — an “old-fashioned privy” — that did not require running water or electricity, according to the decision written by Judge Robert Simpson. In the state court’s majority opinion, Judge Robert Simpson cited other instances where the Yoders used electricity and were not shunned by their conservative religious community. They had used telephones and power tools and had ridden in cars, Simpson observed. He rejected the family’s argument that they should simply be allowed to keep using their outdoor privy, which lacks electricity and running water. My understanding here that the resolution the state wants would require some sort of permanent connection to the electric grid, and not just an electric device powered by non-public power means (as suggested by the article title: “Pa. court rules against Amish family and its privy, orders sewer and electric connection”, and also in this 2016 article describing a solution involving “an electric supplier”). The argument would be that since this family has previously made limited use of technologies which use electricity, they should have no objection to a permanent electric connection. What’s wrong with a public power connection? The above argument of course ignores nuance – the difference between a permanent public electric connection on property you own, versus simply using a device on a limited basis, or deriving power from sources that are not a permanent public connection (batteries, diesel engines, solar panels, etc). Amish traditionally have objections to public power based around several issues. One is the symbolic nature of having a permanent power connection to “the world”. Accepting this connection would mean accepting change imposed from outside, something more traditional groups especially would be apt to oppose. Change can be a slippery slope. Concern over where small changes can lead is a strong source of resistance to it. Practically speaking, Amish also recognize a difference between a public connection which provides unlimited power, and more limited usage such as via low-power batteries. Amish concerns are that a public electricity connection, even one that begins in a limited manner, can open the door to using any manner of electrically-powered devices. So most Amish, even on the more progressive end of the scale, do not permit public power connections to their homes (an exception is the very small “electric New Order Amish” minority – see point #5 here – which does permit a public power connection to the home). The Sugar Grove settlement is nine church districts strong, so not a small community. And if the Yoders are using an outhouse, this is likely a plain community. 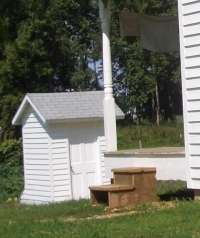 Conventional in-home plumbing is common among Amish, likely moreso than relying solely on outhouses (though Amish schools even in progressive communities have outhouses). One thing that is unclear is why only one family is involved in this case. Perhaps others in the community accepted the sewage/electric installation (I doubt this), or perhaps the county has chosen one family on which to make a legal case against. Or, they may be one of the few which are affected by the township law in consideration, which requires properties abutting the sewer system to connect to it. The court ruled that that using an electric pump was ​the “least intrusive means” of connecting to the sewer system. In a dissenting opinion, Judge Patricia McCullough expressed concern with the ruling, saying there were other ways of disposing of sewage in a sanitary way that would not infringe upon the Yoder family’s religious rights. That’s a concern shared by Sara Rose, a senior staff attorney with the American Civil Liberties Union. “They didn’t consider the other ways that the government could have achieved its ends,” she said. She also said the decision unduly put the burden on the Yoders. She was also concerned about the possible effects of the case, which she said is one of only a few to apply Pennsylvania’s ​Religious Freedom Protection Act. While the case doesn’t establish precedent, she said it could be cited in future cases. It seems alternatives could include powering the pump by some other means, such as a diesel engine. So will the Yoder family give in to the requirements? My guess is that they would more likely move to a different community, or perhaps a property that doesn’t fall under this township requirement. Amish, especially the more conservative as we can assume this group is, are not apt to adopt culturally-threatening change – particularly when handed down by the state after ten years of resistance. In other clashes between Amish cultural and religious practice, and state interests, we have seen compromise on both sides (as with the Wisconsin smoke detector controversy, or a Swartzentruber community adopting unique buggy markings). Is there still room for compromise here? I think this is a bad decision by that community. I imagine the Amish have back flashes to the beginning of their formation when the government took over religious beliefs and practices. This is a slippery slope. Compromise is always the best solution. Where are the big guns of equal rights and freedom of religion? Where are those vocal voices that stand up for Muslims, Buddhist and other religions who protest the states interference? I agree with you. The Amish or anyone else should not have to be made to have electricity. There is nothing wrong with people using outhouses. Appalled at the ruling of this judge. The judge referred to cases to verify his ruling but does maybe the other cases were not OLD ORDER AMISH. I know Old Order do have plumbing in their homes, however, it is against their religion to have electricity. Why is the court using their power to try an change Amish beliefs. I’m sorry the Yoder’s had to endure this for 5 years. I understand where they stand so why doesn’t the Judicial System? Shame on the Judge. I love the Amish and their beliefs and customs, don’t ruin such a beautiful thing for them. This court decision reflects the continual erosion of constitutional”guaranties” and double standards enacted by oppressive biased authority legislating from the bench and local government.Judicial watch should rally behind their right to live free and insure proper accommodations for a feasible environmental solutions. Government only bends over backwards for selective cultures. Bad ruling! I hope the others in this community speak up and speak out, as it will affect them all. They may need to move, if only to a township not covered by this ruling. YES, where are those who are outraged when OTHER religions find their beliefs challenged in this country with our so-called freedom of religion? How would this ruling apply to the English who are increasingly going “off the grid” if only to save their energy dollars? Will THEY be ordered to connect to the grid (for the same purpose as the Amish mentioned here) and not rely solely on their solar-generated power? Does this sound like Big Brother to you, as it does to me? We should get BEHIND the Amish on this one, so that we are not all UNDER the changing whims of the government! Like Debbie H, I, too, am stepping off my soapbox now! Given that the Amish have more likely than not been living in that area and that specific community – nine churches – far longer than the sewage system has been in place, I am led to wonder what it took to get that sewage system put into that particular location where it was known that the Amish had long been residing, and, knowing that such “improvement” would clash with the ways of the “Old Amish”. And, who blew the whistle and why? If no harm was being done by the existence of a single, old outhouse, what happened to “live-and-let-live”? It’s quite possible that the Amish expanded to purchase land abutting the sewer system rather than the other way around, can’t really say from the information I’ve been able to find in the media on this case. As to your other points, I’d agree that if there is really no potential for harm here, an alternative solution would be preferable. Sometimes these issues are driven by behind-the-scenes conflicts that the media-consuming public is unaware of – clashes between Amish and non-Amish ways can lead to dislike of the Amish. Generally where there is goodwill, solutions and compromise can be found. I suspect that in this case it is lacking for whatever reason. No Land Title - No Private Rights! The problem here, is not a utility issue. The Problem is that a “Deed” to “Real Estate” is NOT a Land Title. It is a License for a Foreigner to Temporarily Occupy NOT To Own and It does NOT Confer “Title” – PERIOD! Read the Real Estate Section in the original 1776 Pennsylvania Constitution and See for Yourself. Pennsylvania has a Land Office and that Office Issued Tens if not Hundreds of Thousands of “Land Patents”. Lawyers, Tricked us into Recording our land as real estate, and thereby we volunteered to surrender our True Land Ownership. If you want an Eye-Opener, obtain a copy of a Pennsylvania Land Patent from the Pennsylvania Archives in Harrisburg and Read It for Yourself. Therein, the Commonwealth “Surrenders” almost All Claims to the Land, and under Patent Ownership [NOT Registered nor Recorded with the County], government Cannot Regulate use nor tax the land – Period! This Family Already Owns Actual "Title" to the Land! They Just Haven’t Claimed as “Assign’s” to the Original Land Patent. The U.S. Bureau of Land Management, “NEVER” Issued one of their defective land patents, in Any of the Original former Colonies, because Only a Nation Can Issue a True Land Patent – “Conferring Actual “Title” to the Land. That “fact” is but one Proof that Pennsylvania, just as “ALL” of the other 49 states are Sovereign Nations! Pennsylvania, has a Land Office. It is located in the Forestry Building in Harrisburg. It took one many trips and 9 months to find it, in 2003. One-here, has been studying land patents for over 18 years. I want to know what happens in a major natural disaster when people’s systems do not even work? Does that person have to appear in court at a certain time to address their crime of not being “modern” enough because they can’t fix their sewage problems in time? I agree with Judge Patricia 100%. There are other ways of disposing sewage, not just the way these judges believe. The Amish do well even with traditional sewage disposal ways. They aren’t dying like flies from malaria or other diseases. Amish rides in cars is not a reason to enforce our belief system on them. Those drivers are HIRED. Bishops decide if a man can use powered tools in his place of business NOT THE HOME. And many homes have diesel powered appliances of one sort or another. Forcing them onto the grid is intrusive. It’s the government coming into our homes telling us how we may live. I get some choices may sound old fashioned to some and other choices outrage folks…but if we have freedom of religion in this country then we need to buttout. I hope this family appeals this to SCOTUS. The judge is just wrong. I wish all my neighbors were Amish and I would not care if they had an outhouse. The Amish believe in God, right and wrong, they help each other as well as us outsiders. I admire their ways, something I could not do. God Bless all Amish. The judge has his pockets lined for $. This is ridiculous -The Amish have lived in PA longer than he has been a judge. Courts have no right to tell The Amish people/lifestyle and religion how to live. Forcing electrical hook up is wrong and I’m sure it is all about the Power company and Judge somehow pushing this issue. I hope a very good law firm steps in to help this family. The Keystone state is “Common Wealth” for the good of all the wealthy Friends and Family” And NOT ALL People. Just what I’ve seen since I’ve lived here.